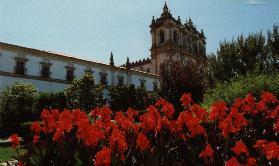 Alcobaça:-A provincial town situated in a valley where the rivers Alcoa and Baca join. Cistercian Monastery of Alcobaca. Begun in 1178, facade re modelled in the 17th and 18th centuries in baroque style. Gothic portal; tombs of King Pedro and D. Ines; mediaeval sculpture; water course diverted to run through the ancient kitchen. Alcobaca is famous for it's Cistercian abbey, one of the finest architectural monuments in Portugal, and one of the first examples of Gothic architecture in Europe. The town grew up around the abbey which was an important centre in mediaeval times. The surrounding countryside was cultivated by the monks for almost 700 years and it remains today one of the most fertile regions in the country. The city of Alcobaça became notable after the first king of Portugal, Afonso Henriques, decided to build a church to there celebrate the conquest of Santarém to the Moors, in 1147. The church later evolved into the Monastery of Alcobaça, one of the most magnificent gothic monuments in the country. In the church are the tombs of King Peter I and his murdered mistress Inês de Castro. A few kilometers to the north of Alcobaça is the Monastery of Batalha, an impressive gothic building constructed in memory of the important battle of Aljubarrota. To the west of Alcobaça is the well-known former fishing village of Nazaré ,now a town. To the south is the city of Caldas da Rainha and the mediaeval town of Óbidos that is an attraction for any tourist who enjoys a true glimpse of the past. To the northeast is the town of Porto de Mós with its fanciful rebuilt castle.